The National Weather Service has issued a freeze warning for most of Southeast Texas including Missouri City from midnight through 9 a.m. tomorrow, Tuesday, March 5. Freezing temperatures between 25 and 32 degrees are expected by early Tuesday morning. Additionally, monitor local weather reports before travelling around the area and sign up for emergency alerts at www.MissouriCityReady.com and Twitter—@MissouriCityEM. City staff is monitoring all roadway conditions, if there are areas of concern in your community, please call 281.403.8700. The National Weather Service has issued a flash flood warning for the Brazos River in Richmond until Thursday, Jan. 10 with water level at 45.45 feet at 11:15 a.m. today (Jan. 8). This has caused minor flooding in some areas including portions of the Edible Arbor Trail on Oyster Creek in Missouri City. Staff has evaluated this section and closed both sides of the trail under FM 1092 (Murphy Road) with barricades until the water recedes. Residents are advised to avoid these high water areas and use caution while walking on the trail and in Mosley Park. According to the Fort Bend Office of Emergency Management, the river’s forecast crest level is about 10-feet lower than both Hurricane Harvey and Memorial Day in 2016, and 5-feet lower than Memorial Day and Tax Day flooding in 2015. For details on current water levels, click this link: http://bit.ly/2sgyd2P. Residents are encouraged to avoid traveling through flooded areas, and remember: Turn Around, Don’t Drown.City staff is monitoring area waterways; if there is a concern in your community, please call 281.403.8700. Residents are also encouraged to sign up for emergency alerts on www.MissouriCityReady.com and Twitter—@MissouriCityEM. The National Weather Service has issued a flash flood watch for a portion of Southeast Texas including Missouri City from 6 a.m. today (Wednesday, Jan.2), through noon tomorrow (Thursday, Jan. 3). Rainfall totals of one to three inches with locally higher amounts are expected in and around the region. Due to the recent rains much of the area remains nearly saturated and numerous area rivers remain elevated. This additional rain could contribute to rapid rises on area rivers, creeks and bayous including Oyster Creek. Residents are encouraged to take precautions if necessary and monitor local weather reports before travelling around the area and sign up for emergency alerts on www.MissouriCityReady.com and Twitter—@MissouriCityEM. Additionally, keep the streets clear of vehicles/debris to allow safe passage for our Public Safety and Public Works vehicles, keep the drainage system clean and protect your vehicle. Avoid traveling through flooded areas, and remember: Turn Around, Don’t Drown. Ready Harris (www.readyharris.org); 713.881.3100; the Harris County Office of Emergency Management’s official website. Enable Fort Bend (www.enablefortbend.com); 281.238.3514; the agency assists individuals with functional and medical needs during an emergency or disaster. Flash Flood Watch in Effect Until Noon Tomorrow; Runoff Election Polls Open 12/8 From 7a.m. to 7 p.m. 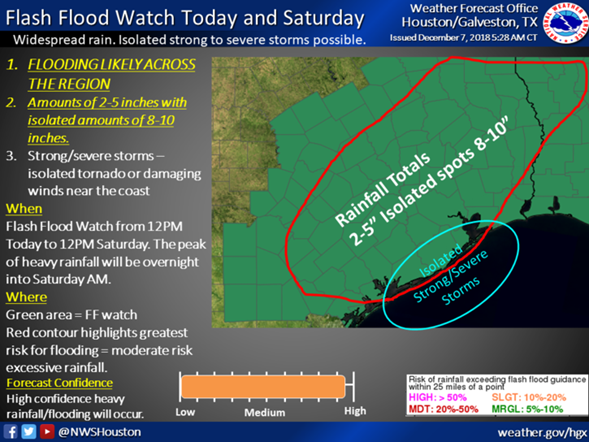 The National Weather Service has issued a flash flood watch for Central and Southeast Texas including Missouri City from noon today (Friday, Dec. 7), through noon tomorrow (Saturday, Dec. 8). MCTX Emergency Management staff is closely monitoring NWS forecasts that show the potential for heavy rain, severe thunderstorms, street flooding, cold temperatures, strong winds and possible tornadoes late this afternoon and tomorrow. As officials here track weather developments, local waterway levels and road conditions, they advise citizens to be cautious about high water on neighborhood streets and should they encounter water to: Turn Around, Don’t Drown. And, residents should avoid parking on the street to allow emergency management and public safety vehicles clear passage. Additionally, crews are also monitoring City storm drains and Staff will continue to provide weather updates in real-time to residents via the citizens’ communications tools. The 2018 Runoff Election for Mayor and Council At-Large Position #2 with terms of office from November, 2018 to November, 2020, will still take place citywide tomorrow, Saturday Dec. 8 from 7 a.m. to 7 p.m.
Hunters Glen Elementary School, 695 Independence Blvd. Lake Olympia Marina Clubhouse, 180 Island Blvd. Lantern Lane Elementary School, 3323 Mission Valley Dr.
Lexington Creek Elementary School, 2335 Dulles Ave.
Missouri City Community Center, 1522 Texas Pkwy.  Quail Valley Elementary School, 3500 Quail Village Dr.
Fondren Park Community Center, 11800 McLain Blvd. 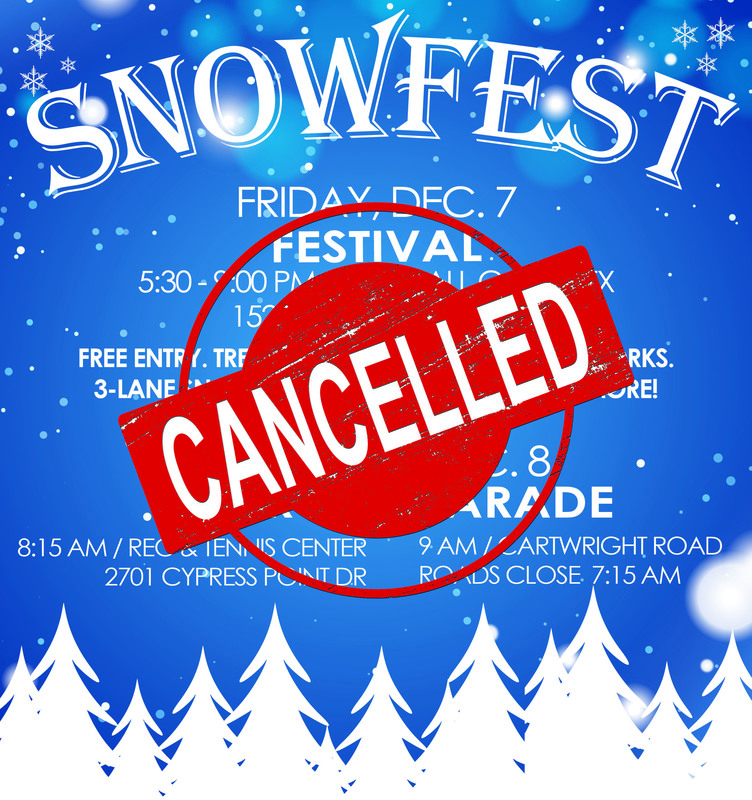 For additional information, please visit the City website: http://bit.ly/2FDjqJ4. Quail Valley Golf Course, 2880 La Quinta Dr., will make a determination on tee times for tomorrow based on the weather; however, the City Centre and The Grille will be open regular business hours. The Recreation & Tennis Center, 2701 Cypress Point Dr., will be open regular business hours as well. Residents who participate in the Municipal Solid Waste Program will receive regular pickup service from WCA Waste Corp. Friday, Dec. 7 and Saturday, Dec. 8. Homeowners who have questions regarding pickup of trash or recyclables may contact WCA directly at 281.403.5800. For updates, residents are encouraged to monitor local weather reports, to watch the City websites: www.MissouriCityReady.com and www.missouricitytx.gov, like us on Facebook—fb/MissouriCityTX, follow us on the Emergency Management Twitter—@MissouriCityEM, Instagram, Snapchat, Twitter—@MissouriCityTX and Nextdoor, to watch Missouri City Television (Ch. 16 on Comcast and Ch. 99 on AT&T U-verse) and to call 281.403.8700 to report any high water levels or street flooding.